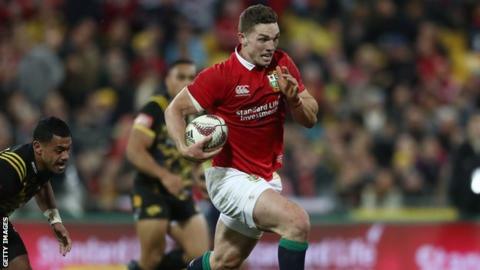 Wales wing George North and Ireland centre Robbie Henshaw have been ruled out of the British and Irish Lions tour of New Zealand. Northampton's North has a hamstring injury while Leinster's Henshaw has damaged a pectoral muscle. Both were injured during Tuesday's 31-31 draw with Hurricanes. Neither featured in the Lions' opening Test defeat and they will leave the tour party after Saturday's second Test in Wellington. North, 25, starred with two tries in three Test appearances when the Lions beat Australia 2-1 in the 2013 series. Henshaw, 24, was on his first Lions tour, having played 29 times for Ireland. Lions coach Warren Gatland said: "It's unfortunate with Robbie doing the pectoral muscle, which puts him out so he's heading back to Ireland - I think he has an operation on Monday. Podcast: Gatland's second Test selection - plan or panic? "And then George with the hamstring as well. It's unfortunate for him and his tour is over as well." However, Gatland says the Lions have been "lucky" overall. Scotland full-back Stuart Hogg was first to leave the tour after suffering a facial injury in their third tour game. He was followed by Wales back-rower Ross Moriarty, who succumbed to a back problem. The Lions lost the series opener 30-15 in Auckland, and go into the second Test in Wellington on Saturday with captain Sam Warburton coming in on the flank. Gatland has also brought in Johnny Sexton at fly-half with Owen Farrell moving to inside centre.